12 square sections that I have stored some of my favourite lipsticks in. A large square section where I have my large cotton pads, hair serum, hand cream and my Baby Lips. 2 rectangular sections, one of which is unused at the moment. But the other section holds my two Simple eye creams. One shallow rectangular section, where I have my Rosehip Oil and hand gel. 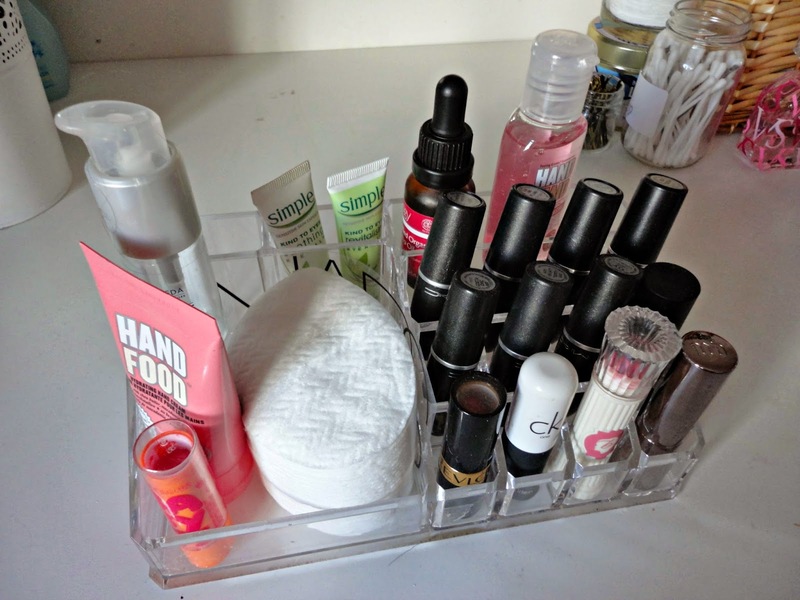 I store this on my Ikea dressing table, and it's so convenient as I can just grab my most used items from this unit, rather than leaving them lying around on the table, or rummaging through my drawers to find them! For anyone who's interested in the lipsticks, I may do an updated lipstick collection post, as my last one was a good while ago and I've definitely added to it since then! Just let me know.